Of all the villains who populated the books, comics, films and role-playing games of my youth, one figure stands head and shoulders above them all: Thulsa Doom. Thulsa Doom was, what my mother would call, the evil baddie in the 1982 film Conan the Barbarian, which starred Arnold Schwarzenegger as Conan. I first saw the film at the cinema at the age of ten with my brother and my best friend Gus. Before going, I was terrified of being made to feel unwell by reports of gore and bloodshed, for I was pretty squeamish at that age and couldn’t bear the sight of blood. Gus, who had already seen the film, warned me of a scene with a soup made of human body parts. Funnily enough, I misheard him and thought he had said a “suit”. The soup, ultimately, was mild by comparison, and when I came to see the movie, perhaps on account of the gore being rather stagey and over the top, I enjoyed it thoroughly. And there, before me, for the first time, was Thulsa Doom! 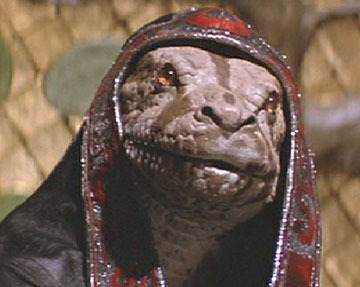 Thulsa Doom was, and still remains, an absolutely splendid villain. 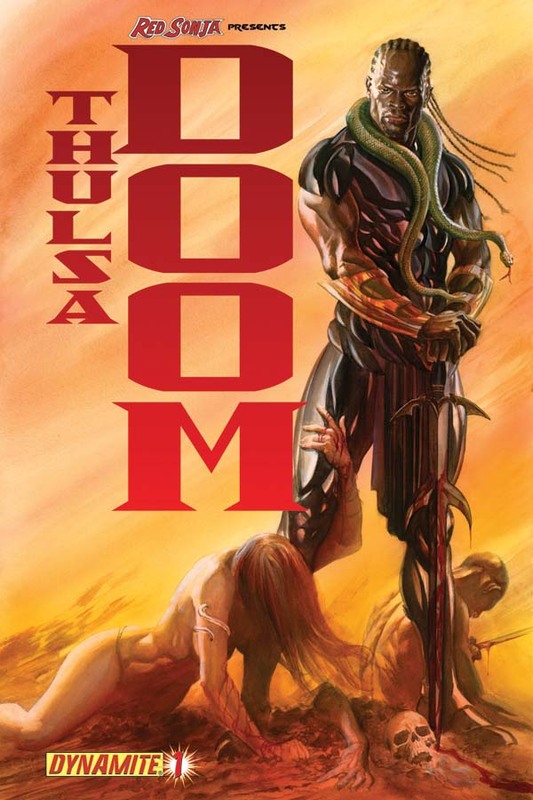 A god of sorts, with the ability to change himself into a giant snake, Thulsa Doom was more than a thousand years old. The leader, chief priest and guru of an ancient cult of snake-worshippers, he was a fearsome warrior, a demagogue, a philosopher, and a downright murderous son of a serpent. 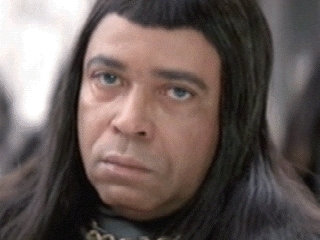 Played by James Earl Jones, with long black hair and a frighteningly square helmet fringe, decked out in chunky, adorned black leather armour, armed not only with two murderous, serpentine swords, but also with the voice of Darth Vader, he was certainly something to behold. Thulsa Doom had a mesmerising stare, an enchanting voice, and a wonderful way with words. He first appears on the screen in the opening scenes of the film, in the frozen wastes of the Cimmerian north. Having, with his warband, raided and wiped out Conan’s village, Thulsa Doom approaches Conan’s poor mother, who stands defending her young son. Flanked by his two stalwarts, Thorgrim and Rexor – Norse metal-heads never looked so good – Thulsa Doom removes his horned helmet, revealing a noggin that seems curiously moulded to the shape of said headwear. The scene is a masterful combination of sad music, pathos and lingering stares. Thulsa Doom, without a word, hypnotises Conan’s fiercely defensive mother with his big, beautiful eyes, so that she lowers her sword and relaxes, in a sort of trance. Slowly turning, as though to walk away, he suddenly swings back in her direction, removing her head with the very sword we had seen Conan’s father forging through the opening titles, now taken as loot from his mauled corpse. Conan, looking up and into the face of Thulsa Doom as his decapitated mother falls beside him, is not about to forget either the visage or standard of his mother’s murderer in a hurry. Thus begins this epic tale of survival and revenge. 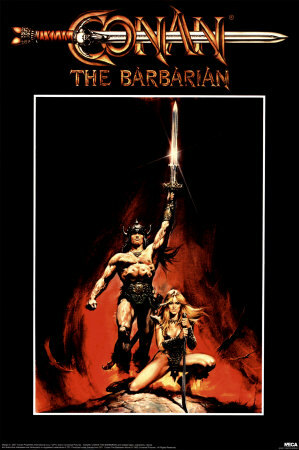 Despite its being something of a fantasy genre gore-fest, Conan the Barbarian is a surprisingly good film. It has its flaws, technically and dramatically, but written by Oliver Stone and directed by John Milius, it was a serious attempt to render the epic nature of the original Conan stories by Robert E. Howard. Beautifully shot and with a very moving soundtrack composed by Basil Poledouris, it feels at times more like a sword and sandal epic of the 50s and 60s than a fantasy genre film. The great sets and locations and the use of thousands of extras in vast crowd scenes, give its settings a very real and tactile quality, whilst the limited dialogue is terse and laconic, but nonetheless emotionally engaging. I was absolutely blown away by the movie when I first saw it, largely because I had, just a year before, started playing Dungeons & Dragons and reading a lot of fantasy literature. It was very much my cup of tea – an enthralling evocation of a fantastic world that felt authentically historical. Shortly after seeing the film for the first time, my brother and I began collecting the original Conan stories, which we were to read and re-read avidly through our teen years. I went to see the movie twice at the cinema, and as soon as it was released on television, recorded it on the VCR and watched it repeatedly. I became so obsessed with the film that I kept a tally of how many times I had watched it in my diary – an early indicator of a life of mildly autistic behaviour! I learned the entire script off by heart, and could quote it from start to finish without prompting; aided, no doubt, by the relatively limited dialogue in the film. And, all the while, there was Thulsa Doom, looming large as my very favourite on-screen villain, even more so than Darth Vader himself. The character of Thulsa Doom first appeared in Robert E. Howard’s Kull the Conqueror short story Delcardes’ Cat. 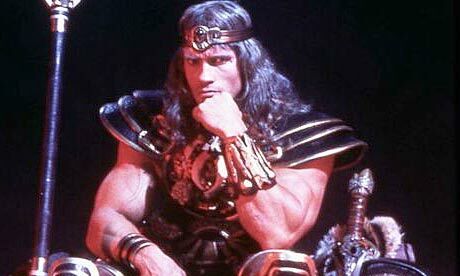 Kull was a sort of precursor to Conan the Barbarian, a hero of the world prior to the destruction of Atlantis. 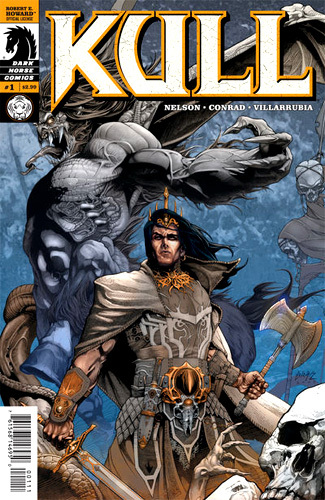 Thulsa Doom later re-surfaced in comic-strip versions of Kull the Conqueror as his principal nemesis, wherein he is portrayed as a powerful necromancer through various editions. 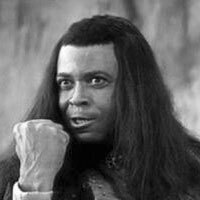 In Oliver Stone’s film version of Conan The Barbarian, Thulsa Doom’s strength seems to lie in his antiquity, demagoguery and hypnotic presence as much as his magical powers. Thulsa Doom can not only transform himself into a snake, but can turn snakes into arrows, which he fires from his serpentine bow. His snake cult engages in the sacrifice of young nubile women to giant snakes reared, in some cases it seems, as pets by Thulsa Doom and his principal henchmen. After a torrid youth spent strapped to the “wheel of pain” – http://bit.ly/WheelOfPain – followed by years in a brutal fighting pit, having excelled as a gladiator, Conan is trained in more delicate martial arts and given an education before being set free one windy night. It is not long before Conan, accompanied by his own henchies, in the form of Subotai and Valeria, has his first run in with Thulsa Doom’s snake cult and begins to plot his revenge. 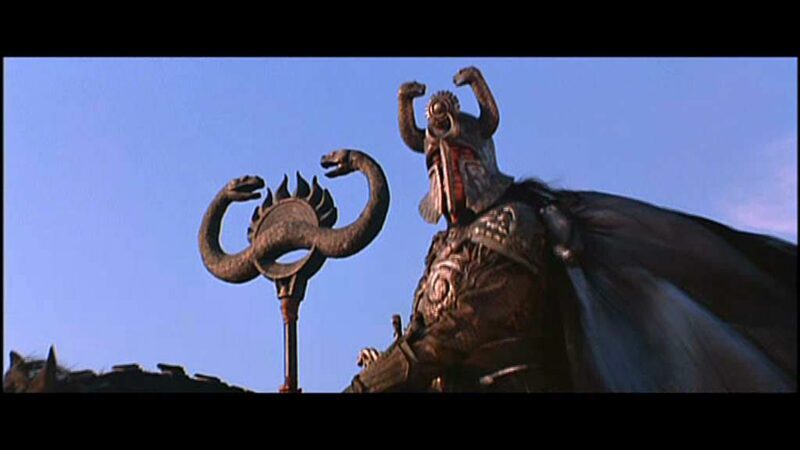 Without wishing to describe the film in detail or at length, it will suffice to look briefly at Conan’s ensuing encounters with Thulsa Doom, which are certainly memorable. Having, in typically megalomaniac fashion, suggested that he himself was the source of all this power, Thulsa Doom admonishes Conan to “Contemplate this on the Tree of Woe,” before instructing his henchmen to “Crucify him.” An order that is duly and gruesomely fulfilled. After having been rescued from the Tree of Woe, Conan and his companions make a murderous raid on Thulsa Doom’s compound, slaying many of his followers and guards. Thulsa Doom escapes by transforming himself into a snake, but, reverts to human form in sufficient time to shoot a snake arrow into Valeria, Conan’s lover, as they flee the scene, sated with the gore of their enemies and having liberated the princess they were seeking to liberate. It is here that we are treated to one of Thulsa Doom’s more memorable lines; one I often find myself quoting when seriously pissed off. Conan, after a long night watching Valeria’s funeral pyre, now with even more reason to detest Thulsa Doom and wish him dead, prepares for the final battle amidst the mounds and gravestones of the ancient dead. Yet the final confrontation does not take place in the ensuing, climactic battle, in which Conan slays both Thorgrim and Rexor, the latter wielding Conan’s fathers sword, taken at the start of the film. 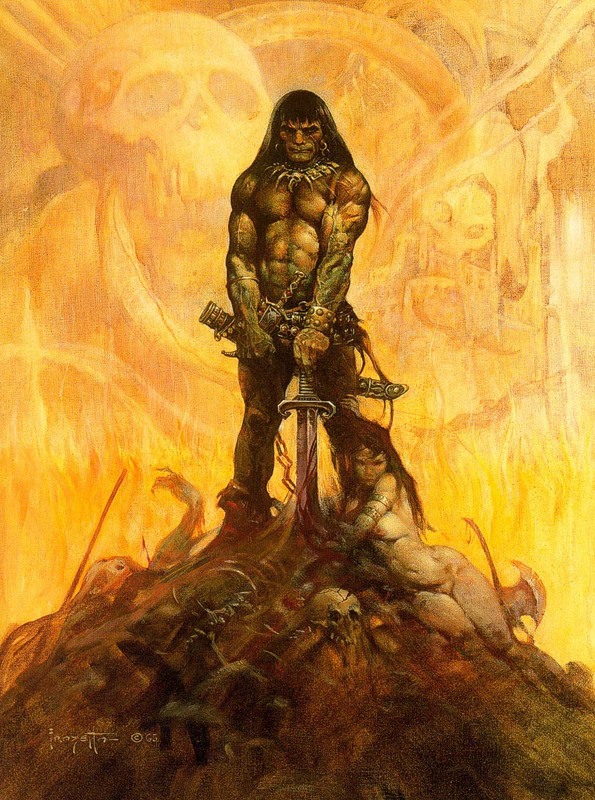 The sword is broken in a mighty overhead cleave by Conan, and, with Rexor dead, Conan retrieves it and holds it aloft. That evening, he makes his way once again to Thulsa Doom’s impressive temple, at the so-called Mountain of Power. It is here, as Conan sneaks his way past the guards, aided by the charms and access of the errant princess, that we are treated to Thulsa Doom’s finest moment. I am still deeply stirred when I hear this speech, and believe it has profoundly affected my rhetorical style over the years. A short while later, Conan approaches from the shadows and comes face to face with Thulsa Doom. Thulsa Doom turns his benevolent smile and loving gaze upon Conan and tries to woo him with his honeyed words. After being briefly seduced by those beautiful, snake-charming eyes, Conan looks down to his father’s sword and snaps out of hypnosis. With a look of sudden alertness, he promptly hacks Thulsa Doom’s head from his shoulders with his father’s broken sword.